If you are a novice investor, it might be very confusing to know the difference between gold bars and gold ingots, let alone figure out if the gold ingots price is better compared to its gold bar counterpart. By definition a gold ingot is a shaped piece of gold metal that is anywhere from 99.5 to 99.9% in purity. When gold is poured into gold ingot mold to give it usually a rectangular shape, manufacturers also mark their products with clear specifications of gold purity, weight and manufacturer’s name and logo. While gold ingot is still a type of gold bar, in general terms ingots are usually referred to massive gold bars like London Good delivery bar weighing in at whopping 400 troy ounces. 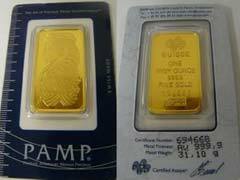 To figure out gold ingots price, you simply need to multiply this by the current spot price of gold that is currently $1,428.13 as of March 21, 2011 and receive a very impressive amount of $571,252 and that’s not including its dealer premiums. Frankly speaking, this gold ingots price is very impractical and simply unattainable for an average gold investor. And if you consider trying to sell this type of gold ingot, you might have to incur very hefty assaying costs associated with testing your gold ingot for purity. Gold ingots for sale might be more suitable for large financial institutions and not everyday investors. Gold bars, on the other hand are easy to buy and sell, come with lower premium charges compared to gold coins and ingots, and in a variety of convenient sizes ranging from 1, 10 oz to all the way up to one kilo bars and are considered nearly the best investment option when it comes to investing into physical gold. According to gold price prediction conducted by major precious metals analysts, gold price has not reached its possible top figure and will continue going up allowing many gold investors to capitalize on world’s best precious metal.